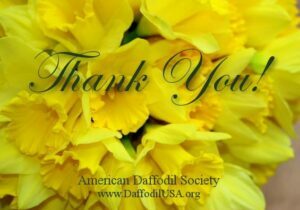 Membership in the American Daffodil Society (ADS) funds various publications, and events, and helps to fund our Internet services operating costs. To join the ADS, sign-up using our Webstore and become a member today. The ADS is a 501(c)(3) nonprofit, educational, charitable organization supported by donations and memberships. Donations to the ADS help fund our Internet services operating costs. Data-center costs for physically hosting our servers, powering them, and providing internet access is a significant cost. To make a financial donation to help offset the costs of providing these Internet resources and services, use our Webstore and help our nonprofit charity today. By simply viewing daffodilusa.org web pages, you contribute to the popularity of this site. Daffodilusa.org readers range from daffodil loving gardeners, knowledgeable growers and award winning exhibitors, to world renowned hybridizers, species experts and scientists. Our visitors primarily live in sixteen countries but more interesting is that daffodilusa.org visitors are from almost every part of the world! The ADS is committed to providing a wide range of daffodil information sources using the Internet. To this end, the ADS maintains and hosts five daffodil websites on ADS owned computer servers, the main ADS web site: daffodilusa.org, the discussion forum: DaffNet.org, the free online library: DaffLibrary.org, free daffodil programs and presentations: DaffTube.org and the Daffodil Database complete with pedigree trees, descendants lists and historic and modern photos: DaffSeek.org. These servers are located in a commercial data-center in the United States. All of the free resources and information we provide on the Internet is part of the American Daffodil Society’s mission to educate the public about daffodils. Help us continue to provide these services and make a donation today!